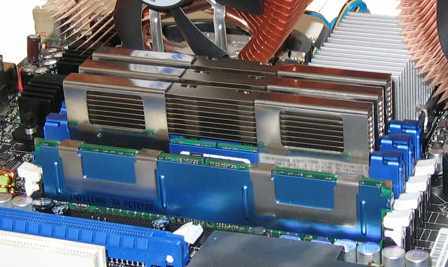 Server DIMM Burn-In Test System. This technical brief provides a detailed explanation of the burn-in/testing process for server memory module. In the world of servers and enterprise system applications, few things are as critical as server reliability. The slightest amount of down time can cost millions of dollars in lost production time and revenue losses. Reliable and first quality memory plays an important role in server reliability because , If the server memory doesn’t function properly, data corruption is possible, resulting in server downtime and very costly for the business. As the world's leading memory testing equipment manufacturer, CST Inc is aware of the stringent requirements for memory used in today's servers. Even though CST is well-known for producing high quality memory tester, CST 's engineers are always searching for ways to improve the design, manufacturing an testing to yield higher levels of reliability for its customers. For the last one year, CST engineers have been exploring ways to reduce the most common cause of server memory failure, Early Life Failure (ELF). By far the most common cause of failure of memory modules , ELF occurs within the first few months of normal use. Once the memory modules are operated beyond the ELF period, memory failures are rare. This technical brief provides a detailed explanation of the burn-in/testing process. 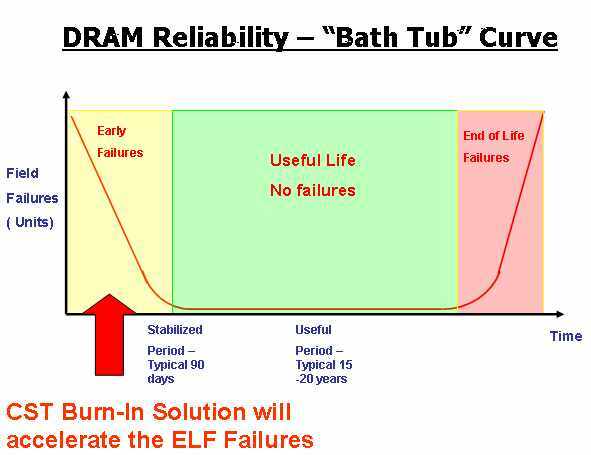 Memory module, as well as all memory devices, follows a predictable memory failure pattern which is known as the Bathtub Curve. To solve the Early Life Failure problem, CST’s engineers designed a proprietary "Advanced Burn-In testing platform, the ABT-1000 to simulate the ELF period with high temperature, high voltage, and pattern testing to screen out potentially defective server memory modules. 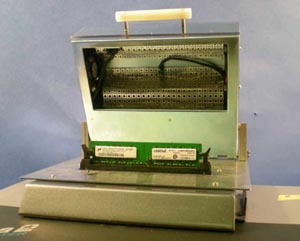 Each Eureka2 tester with the "ABT" Heater Box can test up to 500 server memory modules per 8 hour shift. Server memory modules are tested for several minutes at 70 degree Celsius , at high voltage,and all cells of every DRAM chip are continuously exercised; this high level of stress testing has the effect of aging the modules. CST " ABT" Heater System with the Eureka2 Memory tester and the Results were closely monitored to measure the change in failure after all the tes data was compiled and analyzed, results showed that failures were reduced by 90 percent. These results exceeded expectations and represent a significant improvement for a product line that was already at the top of its class. The significant reduction in potential memory failures clearly benefits the IT manager. IT managers constantly search for products that reduce the potential for system downtime. Since memory plays such a critical role in server reliability, CST ’s server burn-in process represents a significant leap towards achieving the ultimate in system reliability: zero downtime.